The COCKPIT RADIATOR PROTECTOR protects the vehicle’s cooling system. 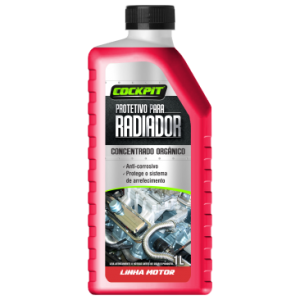 It has a balanced formulation of additives that protect against rust and corrosion, which can cause system overheating. Prevents drying of the hoses and lubricates the water pump, increasing the life of the engine. Suitable for vehicles with gasoline, alcohol, biofuel, diesel and CNG. COCKPIT RADIATOR PROTECTOR meets the most stringent corrosion tests. Drain the coolant from the cooling system and wash until the water comes out clean (see procedures in the vehicle manual or consult a specialist garage). Prepare in a container the required amount of dilution of the grease, as recommended by the vehicle manufacturer. In the absence of this information, we recommend using 40% to 50% of the shield and completing the remainder with water, preferably the Demineralized Water Cockpit. Check the proper functioning of the cooling system for leaks and air bubbles. Have the fluid replaced as recommended by the vehicle manufacturer or whenever maintenance occurs in the cooling system. Do not mix with additives from other brands.